Before I was so unbelievably sick, before the flu and this damn UTI came knocking on top of my already present morning sickness and overall pregnant and Forty-ness......we went to the fair. We have a pretty ok little fair here. You'd really expect more, if you were from the midwest and accustomed to huge fair events - which we are. 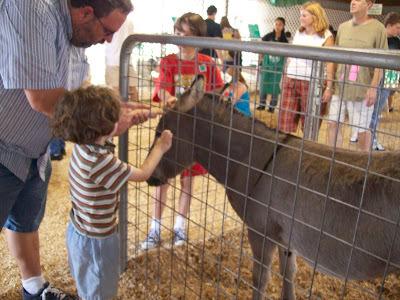 and heck even the Little Birth of Cool braved petting some of the critters. This slide pic is one of my faves. The big boy was the student of the week, and got to bring home his class mascot. 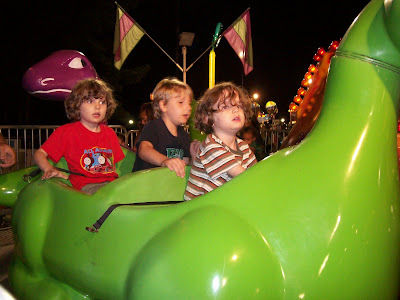 So we took it to the fair - and he took it on rides and through fun houses and the like. But you know as always, the good stuff is the fair food. 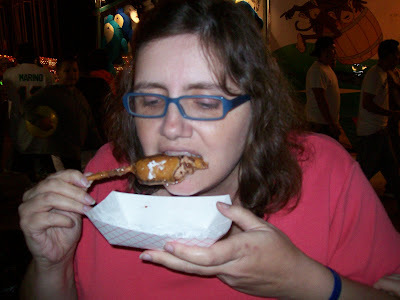 I was a little disappointed at the lack of deep fried foods on sticks, frankly. 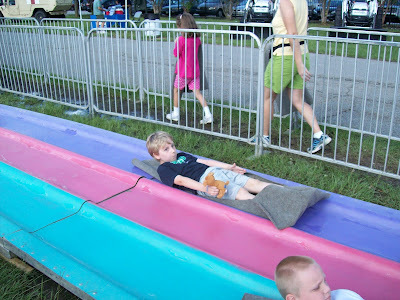 Florida fairs have MUCH better selections! 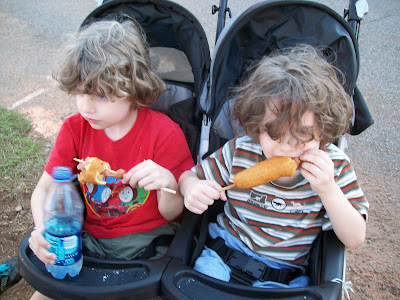 My corn dog was nasty, and I think I'm going to swear off of them. The twins didn't seem to mind theirs - but we checked theirs and it seemed just fine. I got the funky one. 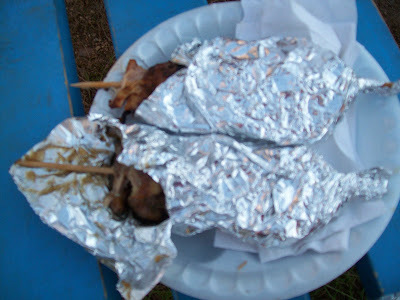 The best meat product we had was this delicious grilled chicken. Mmmmm this is deep fried cheese cake with caramel sauce. 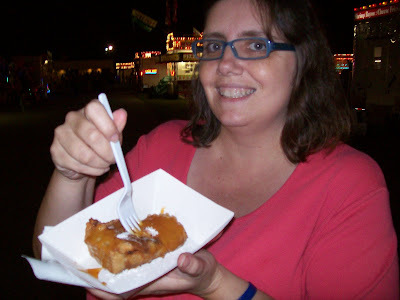 But when is one dessert enough at the fair? NEVAH! So we also had deep fried Milky Ways. 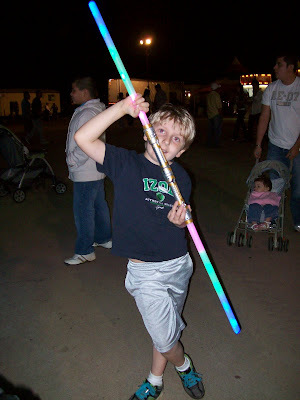 And, I learned at the end of the night .......that my son is a Sith Lord. Who knew? cute! I'm glad you are out and about (or were). And I hope you are feeling better. Pregnant, flu, and UTI. Miserable. I keep reminding myself as I lay in bed with fever and tissue stuffed up my nose, that you had it way worse than me!